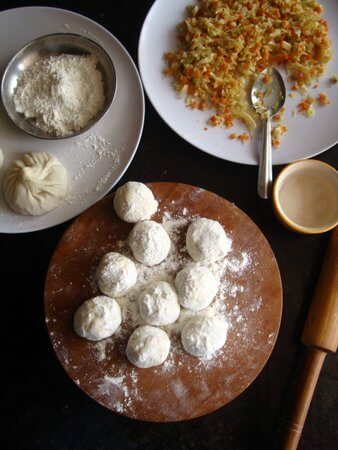 Veg momos recipe is one of the most requested among Indian Chinese food recipes. 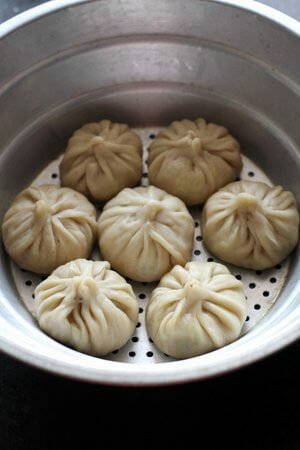 Veg momos are a tantalizing, traditional food of Tibet and Nepal. Momos, dim sum, wontons are different names of a variety of savory dumplings that are popular China, Nepal, Tibet, Bhutan and in many North Eastern states of India. 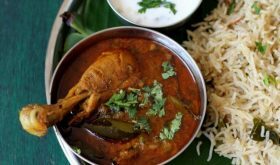 These cute culinary beauties are equally popular in the Hindi speaking states and South India. Walk down to most popular street hawkers selling Indian Chinese food, you are sure to find a variety of momos on their menu list. Momo is a small bite sized savory snack or steamed dumpling with a filling which vary from mixed vegetables, greens, mushrooms, tofu, meat, chicken and shrimp. 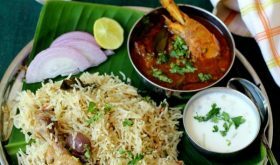 Loyal followers of Sailu’s Food are aware of my love for Indo-Chinese fusion cuisine as my blog is home to many restaurant Indian Chinese starters like mushroom manchurian, chilli mushroom, veg manchurian, chicken manchurian, chilli paneer and many more. I am surprised why it took me so long to post my favourite steamed vegetable dumplings. Better late than never. You will find a variety of momos with different fillings both vegetarian and meat based, different folding techniques, steamed and deep fried, at Indian Chinese food stalls manned by street hawkers especially in North Eastern states. If you are yet to try veg momos then you are missing one incredible culinary creation. You must try these cute vegetable momos at least once as you are sure to get mesmerized by a burst of flavors and textures in each bite. These minimally flavored veg momos with red chutney make for a light yet satisfying dinner. 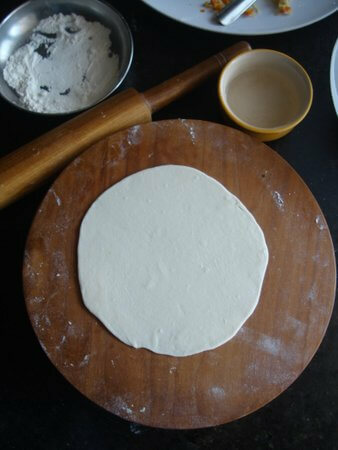 Basically all-purpose flour is used to prepare the momos dough. I have used 2 cups of flour, a teaspoon of oil, salt and lukewarm water to make a soft yet firm dough. I have kneaded the dough for at least 10 mins. 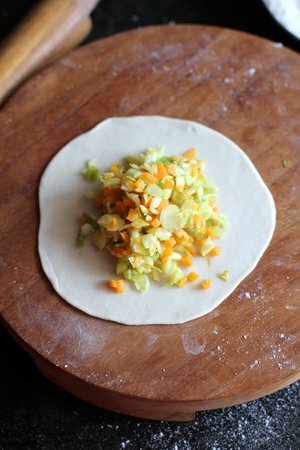 Allow the dough to sit covered and work on the vegetable filling preparation. 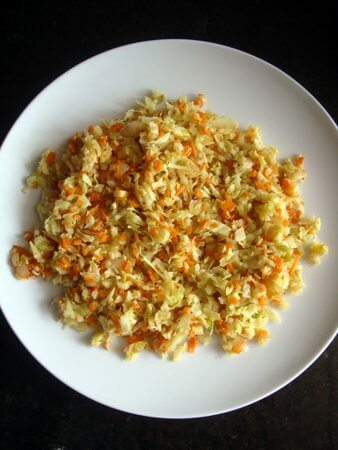 I have used half a head of cabbage, a medium sized carrot, a medium sized onion, a small knob of ginger, two cloves garlic and two green chilies. You can use beans and bell peppers too. Peel and finely chop the vegetables. Heat a tablespoon of oil in a vessel, add the finely minced garlic and saute for a minute. Add the finely chopped onions and saute for 3 mins on medium heat. Add the finely chopped green chilies and carrots and saute for 3 mins. 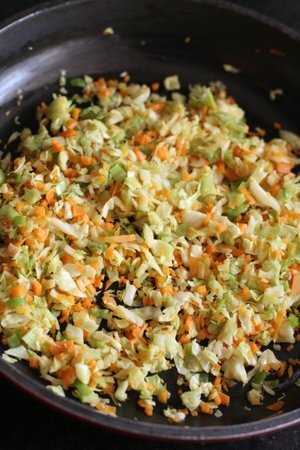 Add the finely chopped cabbage and saute for 8-10 mins. Add a tsp of light soy sauce, 1/4 tsp of black pepper powder and pinch of sugar and mix well. Turn off the heat and allow to come to room temperature. Just before using this filling to shape into momos, add salt and mix. Knead the dough again for a few minutes and pinch out small lemon sized balls of the prepared momos dough and dust with flour. Roll out each ball into a 3″ or 4″ diameter circle. It should not be too thick or too thin in thickness. Place a tablespoon of the prepared vegetable filling in the center of each rolled out circle. Do not overstuff as it will be difficult to form a nice shape. Beginning at one end of the circle, gather the edge to form pleats working your way around the circle and prepare a pouch. 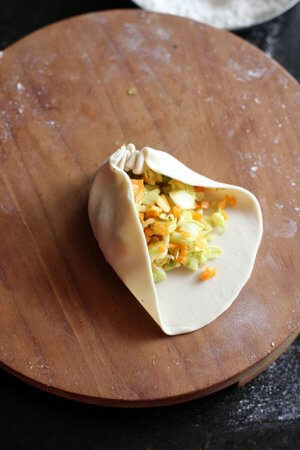 Bring the pleats together to form a pouch-like dumpling and seal the top. Fill and shape all the rolled out circles into pouch-like dumplings. Cover them with a damp cloth to avoid drying out. Grease an aluminum or stainless steel steamer and place the shaped dumplings leaving a little space between each of them. Fill a vessel or pot that’s large enough to place the steamer with 3″ to 4″ of water and bring water to a boil. Ensure that the bottom of the steamer does not touch the water. Once the water coming to a rolling boil, place the steamer in the vessel and cover with lid. Steam on high heat for 10 mins. 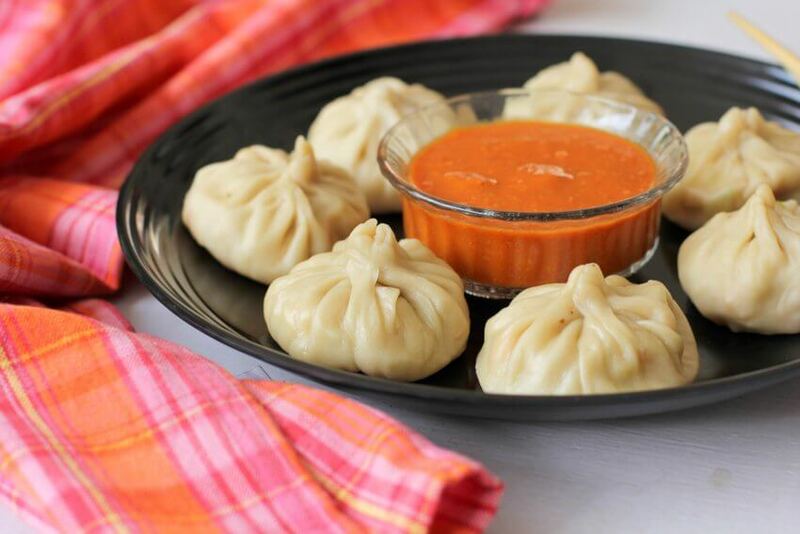 The momos are done when a shiny sheen appears over them. If you have never attempted making momos at home from scratch then do give this veg momo recipe a try and you will come back to thank me for sure. 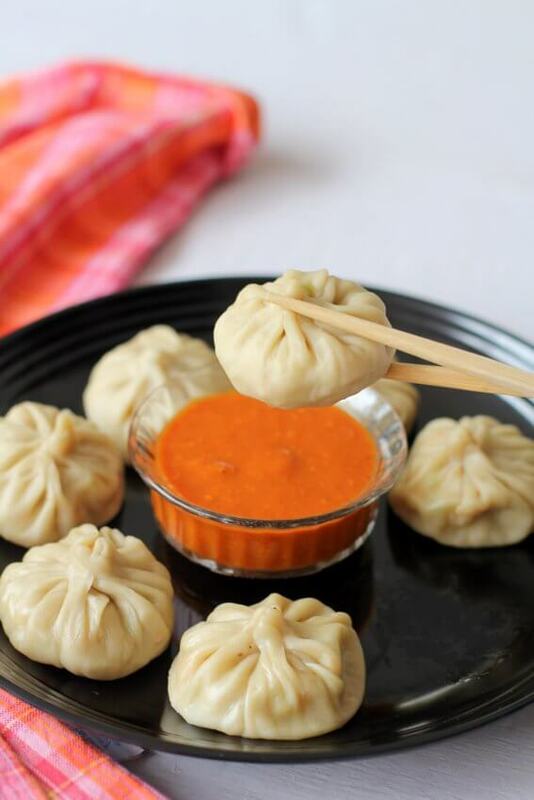 The dipping sauce is a crucial element to savor the authentic flavor of momos. 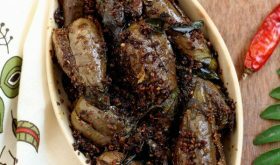 These flavorsome bites are served with a spicy red sauce or chutney which has hot peppers going into its preparation. You can look forward to the momos red chutney recipe tomorrow. These soft, fluffy momos make for a great party food or appetizer. You can also serve veg momos for breakfast or an evening snack. 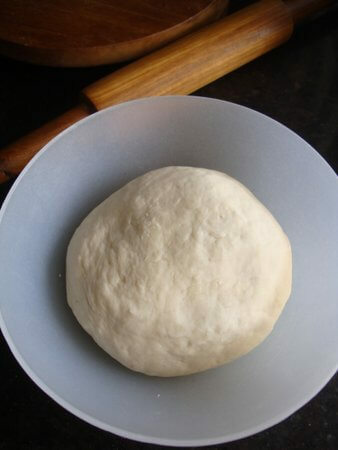 To make momos dough, place the flour, oil and salt in a bowl. Mix well and slowly add warm water to make a smooth and soft dough. Cover with a lid and set aside. To make the vegetable filling, heat oil in a wide pan and add the garlic. Saute for a min, add the chopped green chilies and ginger and mix well. Add the chopped onions and saute for 3 mins till they turn translucent. Add the chopped carrot and cook for 3-4 mins on medium heat. 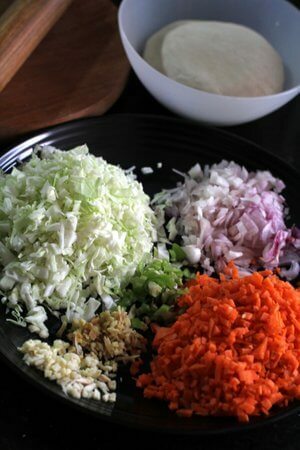 Add the chopped cabbage and cook for at least 8-10 mins. Add soy sauce, black pepper powder and sugar and mix well. Turn off the heat and allow to come to room temperature. Just before placing the filling on the rolled out circle, add salt and mix. 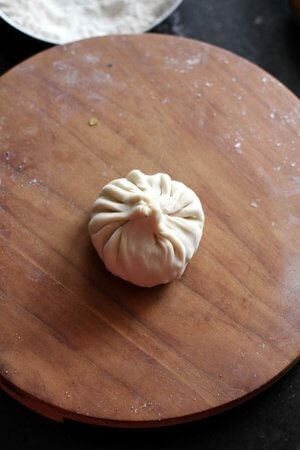 To make momos, knead the dough again for 2-3 mins and pinch out small lemon sized balls of the dough and dust with flour. Roll out each ball into a 3" or 4" diameter circle. It should not be too thick or too thin in thickness. Place a tablespoon of the prepared vegetable filling in the center of each rolled out circle. Do not overstuff as it will be difficult to form a neat pouch shape. Beginning at one end of the flat circle, gather the edge to form pleats working your way around the circle. 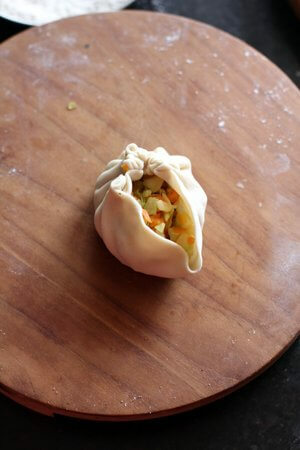 Bring the pleats together to form a pouch-like dumpling and seal the top. Fill and shape all the rolled out circles into pouch-like dumplings. Cover them with a damp cloth to avoid drying out. Grease an aluminum or stainless steel steamer and place the shaped dumplings leaving a little space between each of them. Fill a vessel or pot that is large enough to place the steamer with 3" to 4" of water and bring water to a boil. Ensure that the bottom of the steamer does not touch the water. Once the water coming to a rolling boil, place the steamer in the vessel and cover with lid. Steam on high heat for 10 mins. 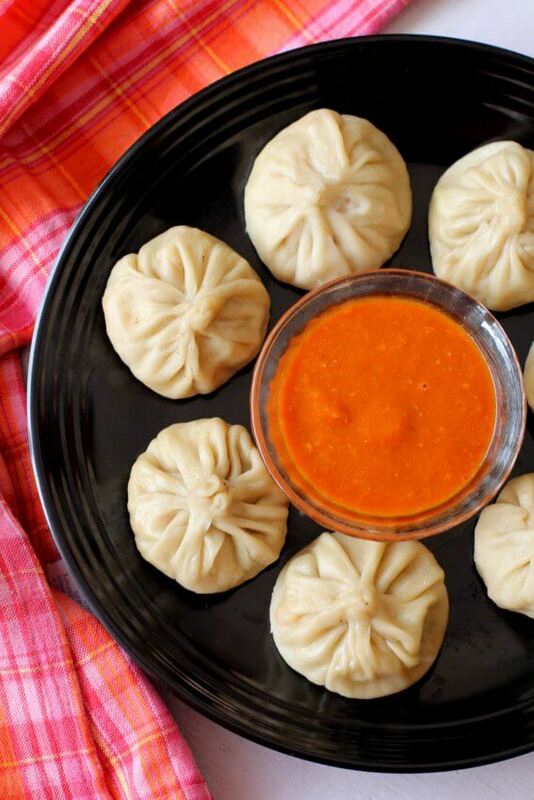 The momos are done when a shiny sheen appears over them. These minimally flavored veg momos with red chutney make for a light yet satisfying dinner. 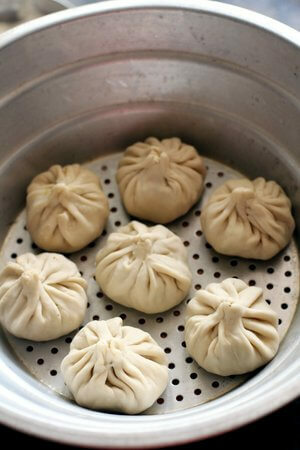 You can use a pressure cooker to steam the momos. Do not use the weight while steaming momos. You can use a bamboo steamer too. You can line the steamer with cabbage leaves or husk of corn and place the shaped dumplings in it and steam. This prevents sticking of the momos to the vessel. Can I use idly plates to steam these dumplings? Yes, grease the idly plate with oil and place the momo in them and steam on high for 10 mins without lid. Yes, prepared them, place a damp cloth over them so that they do not dry out. Steam before serving. what if i do not cook filling? 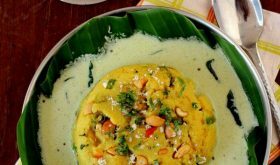 Does it required to cook filling? 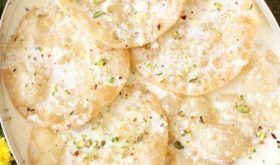 Isn’t a momo just a spicy version of modakam?